If you are looking for a luxurious family camping tent with a complete weather protection, this Vango Capri 500 XL review is for you. Read about an inflatable air beam tent. As the title suggests, this is a tent from the group of inflatable tents, with air beams instead of classic poles. Though its front pole which supports the porch is a fiberglass pole, but the other 4 are air beams, so this is a hybrid model in fact. The Vango Capri 500 XL is also a 3-room design, with a large living area plus two sleeping units. The sleeping area is the tent within the tent, and this part is a double-layer zone while the rest is a single layer tent. So this is again a sort of a hybrid design. Note that the sleeping zones’ divider can be removed and you have a 2-room structure in this case. But the presence of such an inner cocoon tent and its material puts it in the group of dark rest tents; Vango people call this “lights out” design, but the meaning is the same, you have considerably reduced glare and you can sleep longer in the morning. Sizewise, the capacity of this tent is 5 people. But this is unlike anything you can see in typical family camping tents. They were very generous in providing lots of space per person here. The total protected area in the inner tent and under the porch is 19.2 m². 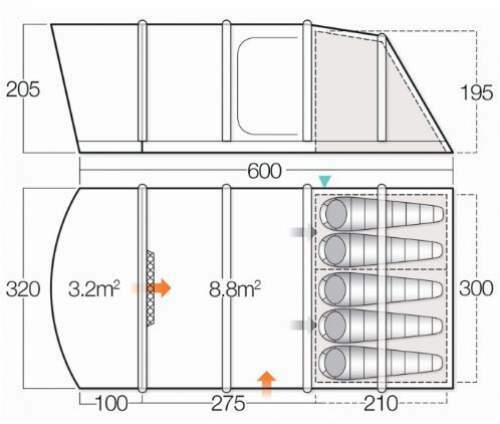 The inner tent area per person is 3.2 m², can you believe this? The floor plan below shows what you have. The sleeping rooms are quite modest but this is only to spend the night. You hardly have space for 5 pads. If you remove the divider, you should be able to fit two queen size beds inside. But the living room alone offers 8.8 square meters, and I see no problem with using this area for sleeping as well. The huge porch area is protected and you can use this zone for cooking and to store some stuff. So you definitely have more than enough space for 5 people. Seasons-wise, this is a true 3-season tent, I would add perhaps even for 3.5 seasons. Its impressive waterproof rating is such that you will be protected in any weather conditions in a 3-season use. But this tent is not best suited for warm areas. I have seen people complaining it is too warm. It is best suited for a cooler environment with lots of rain. After all, this is a Scotish product. The Capri 500 XL is a camping tent, with 48.3 lb (21.9 kg) of weight this is not something to carry around. So you will use it at places with a motorized access. Its packed size is 27.6 x 16.5 x 15 inches (70 x 42 x 38 cm) so you might even transport it on a motorbike. I already mentioned that only the front pole is fiberglass, the others are air beams. In case they get punctured, which does not happen so easily, you can fix them just like a bicycle inner tube. Note also that you can order these air beams from Vango separately. Here you have an impressive waterproof rating in their Protex 70D polyester flysheet, no less than 4000 mm HH, and I can tell you this is not so frequent in family camping tents. This is a highly waterproof and durable material. The floor is a fully waterproof PE sheet, robust and hardwearing fabric with a bathtub design. All seams are factory taped. The floor in the sleeping area is an extra layer and you have a bathtub design here as well, so you effectively have double floor protection in the sleeping zone. At the front you have 3.2 square meters of the covered space, this protects the main entrance and serves as a nice porch. The fabric used in the tent’s construction is fire-retardant and it meets European EN5912 safety standard. You have them on all three sides, but note that this is a solid material, translucent PVC, so the tent is fully closed and protected from the wind and the rain. You have a feeling of being at home. Two beautiful windows are under the porch, one on each side of the main door, and you have one large window on each side of the living area. These large windows also have extra panels from inside so you can put them up for extra privacy and to reduce glare. One large double-layered zippered door with mesh and panel is underneath the porch, so it is fully protected. The other is a side door and it is only a panel, no mesh here. This is not so great and my guess is that many people would rather not use it to avoid insects. But you should know that they separately sell a huge side screen room (or porch) with PVC windows, which you attach to the side. This adds lots of protected area on the side, see more below. You have two inner doors as well, each of the two sleeping rooms has its own zippered mesh door, so you are fully protected. The shell tent is without mesh, so the area is fully closed and the ventilation is based on vents. So you have one vent under the porch, it is located above the main entrance door. The front door is huge and you have mesh here all the way to the top, so you can have lots of air flow here if you roll the door panel to the side. Under the big windows you have vents, see one in the picture below, but you also have one long went on the left side wall close to the floor. One vent is available also on the back of the sleeping area close to the roof, and the sleeping rooms are with mesh on the back and with a mesh on the 2 inner doors. The vents are equipped with Velcro stiffeners and they can stay open all the time. So as you realize, all that you need for a proper ventilation is in place, yet people are complaining that the tent is too warm. But the tent is designed for a cooler environment. One of several large vents. The tent is very tall and it is also the tunnel type which means that the ceiling is heigh practically everywhere. The maximum height is 80.7 inches (205 cm). All the doors are very high, so you have a very livable space. 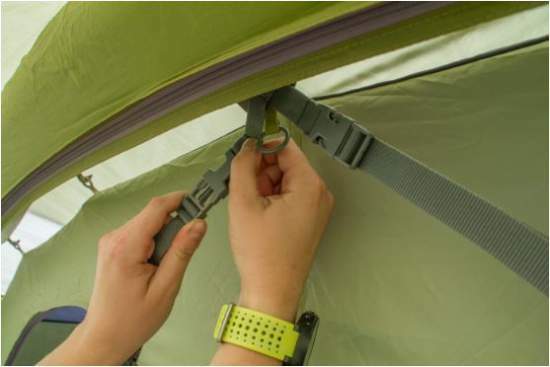 The tent is with the patented Vango TBSII Tension Band System, see the picture below, which ensures that it performs well in strong, changeable winds. The bands brace the pole at 3 points, and this prevents sideways movement. If you do not need it, it can be stowed away. The TBS II system. Observe also the space between the inner tent and the external shell. Note that Vango has an extra part which they sell separately, this is the vestibule with a door, which completely seals the front porch. Currently, it is available on the UK market only and you can order it here. Observe that it is angled so the porch area is extended and the covered space is doubled. You have a really useful protected space here. Accessory vestibule and door for the porch. The side door is without a mesh. Not for a warm environment. The Amazon price of this tent at the moment of this text is $300, and this is considerably lover that the price of their 6-person tent built in the same style. So this is a fair price for such a quality tent. Weight: 48.3 lb (21.9 kg) – this is directly from the manufacturer’s site. Dimensions: 236.2 x 126 in (600 x 320 cm). Floor area: 172.2 ft² (16 m²). Area per person: 34.4 ft² (3.2 m²). Porch area: 34.4 ft² (3.2 m²). Packed size: 27.6 x 16.5 x 15 in (70 x 42 x 38 cm). 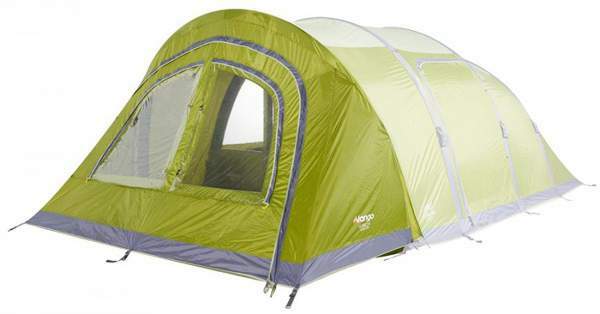 In the summary of this Vango Capri 500 XL review, I wish to stress that I am impressed with the features of this tent. If you use it in a cooler and wet area you will have a totally reliable and luxurious camping tool. The price is fair for the value, and I can fully recommend it. Note, I have included this tent in my list of the best 5 person camping tents. There are several other tents from the same brand presented here in the site, so please have a look around. 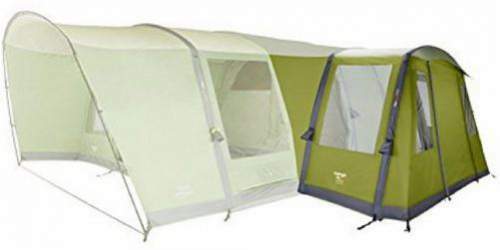 Check my list with inflatable tents and see this Easy Camp Tempest 500 Inflatable Tunnel Tent in particular with its nice 3 rooms. But if you need something totally different, just check in the Categories above. Check this Coleman Rocky Mountain 5 Plus tent with 3 blackout rooms and an impressive waterproof rating. For EU & UK visitors, to check the price or to order this tent, please check here. Thank you for reading. Please use the comment box below in the case of comments or questions. Have a nice day.